California is just a little over a month away from starting adult use cannabis sales and with nearly 40 million residents, it is expected to bring in about US$ 5.2 billion in revenue during 2018. Adult use cannabis has been going on legally in Colorado and Washington since 2014, however, California is a whole new level due to its massive size economy. California is the sixth largest economy in the world and has a huge influence on the rest of the world. No other state ranks higher, with only the EU, China, Japan, Germany and the UK outranking California aside from the US. Adult use cannabis sales in California is a great news for the cannabis cause as it is set to change the game in the US and effectively worldwide. And it is also good for the public purse as California will be imposing a 15% tax on adult use cannabis sales adding up to nearly a billion dollars to be paid in taxes to the state. A lot of money is coming into the legal market from the black market, where it wasn’t taxed before however, as good of a news as it is, it is also a challenge. Banking or more like lack of, has been one of the biggest challenges for the budding cannabis industry from day one. Banks are regulated federally and unfortunately cannabis is still classified as a Schedule I drug by the US federal government. This presents a security challenge for cannabis businesses across the legal states, however, the scale of the problem is about to reach new highs with California being a larger market than all other legal states combined at this point. California State Treasurer, John Chiang formed a task force to work on a solution for gathering the money and armoured vehicles have been floated as an idea to deal with the security challenge of carrying, counting and storing large amounts of cash generated by the marijuana market. Security is not only a concern for tax collection, however, it is a daily reality for cannabis businesses operating in the legal states. Dispensaries and growers need to think about extra security in the forms of surveillance cameras, armed guards and armoured vehicles. With Jeff Sessions as Attorney General, there isn’t much hope for a federal rescheduling anytime soon, so the solution is still uncertain. Some believe that cryptocurrencies and blockchain technology are the solutions, however, cryptocurrencies still fluctuate in value more than a business could rely on as a main form of income. They are still too complex to understand for the regular business owner, that is already overloaded with trying to navigate the legal minefield of cannabis regulations. So at this stage, it is most likely that California businesses will have to do most if not all of their business in cash and deal with the challenges that arise as a result. Share your views with our community in the comments below. 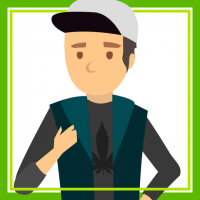 What Does Marijuana Possession Mean in a Non-Legal State? CBD Oil for Anxiety – How It Works?